Anyone not registered has until 9 October to register to vote in the upcoming referendum and presidential election. File photo. Voting in the 8th Amendment referendum earlier this year. 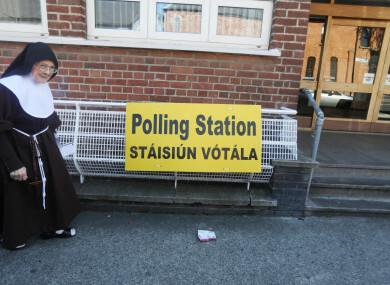 MINISTER EOGHAN MURPHY has made an order appointing Friday 26 October as the polling day for the referendum on removing blasphemy from the Constitution, with the electorate set to vote in the presidential election the same day. A bill seeking to remove the reference to blasphemy from the Constitution passed all stages through the Oireachtas yesterday. The 37th Amendment of the Constitution Bill was introduced by Justice Minister Charlie Flanagan in the Dáil on Tuesday, where it was passed without opposition. Murphy today urged people to have their say on the outcome of the referendum “whatever your views are on the proposals”. Polling will open at 7am on Friday 26 October and close at 10pm that evening. People who wish to vote but aren’t registered to do so, should complete a supplement application form, which available from local councils or online at www.checktheregister.ie by Tuesday 9 October. Anyone wishing to avail of a postal vote, who is not on the existing postal voters register, can do so up to Monday 1 October. In June, Minister Flanagan received Cabinet approval to hold a referendum on the issue. Speaking in the Dáil earlier this week, Flanagan said: “The provision identifies Ireland, however incorrect and misleading that might be, as a country that does not value freedom of expression and one that gives constitutional protection to a concept that many would regard as completely outmoded. Email “Public to vote in blasphemy referendum on Presidential polling day”. Feedback on “Public to vote in blasphemy referendum on Presidential polling day”.